Using Rain Barrels to capture roof run-off helps homeowners conserve water and reduce water bills. Our Rain Barrels are made of durable, UV-stable polyethylene and the childproof design features a safety grid and removable debris screen. The built-in 4 foot hose with thumb valve stores neatly in slot at top of the barrel and the overflow hose diverts excess water away from your house. Easily link two or more together with the foolproof linking kit included with every barrel. You can add capacity as your garden expands. Both fit flat against the side of the house. 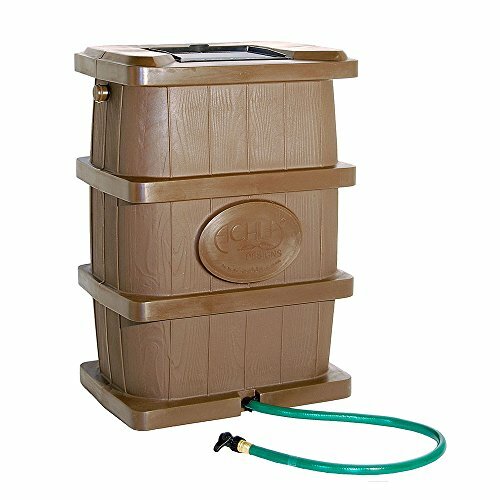 Green Barrel design comes in 50 gallon and 75 gallon sizes, Brown Barrel comes in 54 gallon capacity.